The alleged purse locator picks up the phone. A polite enquiry about his whereabouts at the rendezvous time and place follows. A nonchalant response about getting held up somewhere else is offered. A new rendezvous is agreed upon. 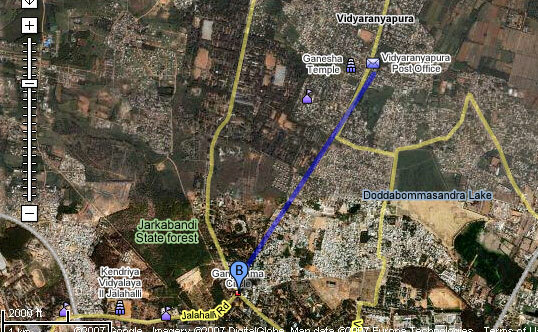 The blue line is the route as the crow flies. Since my uncle in bangalore, who is dealing with the purse locator is neither a crow nor does he possess gravity defying mechanisms, he will of course be taking a route very different from the one shown. One might then wonder why the author bothers to show the blue line. The reader will be relieved to know that it is nothing more than an ardent desire to show off the author’s complete mastery of drawing blue lines on Google maps. Previous Previous post: Purse come purse served..